The Bills released their unofficial depth chart and there aren’t too many surprises in the listings with the team’s first preseason game just four days away. But here are a few that caught our eye. At safety behind starter Aaron Williams, listed as the backup is Duke Williams followed by Jonathan Meeks. For most of the last week, Meeks has seen more and more time at the backup safety spot alongside Robert Blanton than Duke Williams. Whether that trend continues enough to alter the depth chart remains to be seen. CBs Jonathan Dowling and Sammy Seamster have each been listed ahead of veteran free agent Sterling Moore. This is a bit tricky because Moore is seen as the primary nickel corner backup to Nickell Robey-Coleman and has seen a good deal of work in the slot. Perhaps because he’s viewed as a backup subpackage corner he’s listed further down on the depth chart. Kevon Seymour is listed as the backup kick returner behind Reggie Bush. As we noted in this space earlier Seymour has emerged as a new kick return candidate this week as he took some kicks in practice Monday. He previously had not been part of the rotation, but is clearly a candidate now. Greg Salas is listed as the backup punt returner. 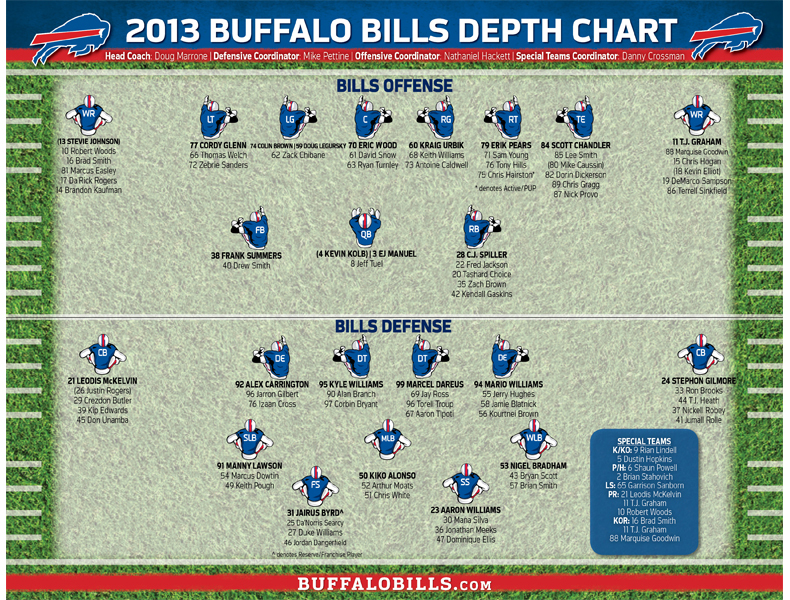 Beyond that there aren’t many surprises on Buffalo’s depth chart. There are a host of challengers for the kick and punt return jobs on the Bills’ roster, but with the release of the team’s first unofficial depth chart the incumbents are still at the top of the list at each position. Brad Smith is still listed as the top kick returner on the depth chart followed by T.J. Graham and Marquise Goodwin. Head coach Doug Marrone touted Smith as one of their top specialists at the start of camp. As for punt return Leodis McKelvin is still atop the depth chart there, but if he remains in his current role as a starting cornerback, returning punts as well might be putting a lot on his plate for an entire season. His backups on the depth chart right now are T.J. Graham and Robert Woods. There aren’t a lot of surprises on the Bills first unofficial depth chart. At receiver though where there will be a lot of jockeying for position and roles, it worth noting how things are laid out here at the outset. The top four receivers listed on the depth chart are Stevie Johnson, T.J. Graham, Robert Woods and Marquise Goodwin. The next sets of pairings are as follows. There are obviously still four preseason games to be played so these positions are likely to be shuffled somewhat before the preseason is over. Just knowing there are eight receivers in the mix for one or two of the final receiver spots should make for some heated competition. The Bills have said when Jairus Byrd returns to the team they’ll welcome him with open arms. That was evident by the looks of the team’s first unofficial depth chart. Byrd is listed as the starting free safety on the depth chart. Aaron Williams is listed as the starting strong safety. In Mike Pettine’s scheme those positions are interchangeable. The backup safeties listed are Da’Norris Searcy and Mana Silva. Searcy has been getting first team reps in the absence of Byrd. The Bills preliminary unofficial depth chart has been released and to no surprise there isn’t a delineation between quarterbacks Kevin Kolb and EJ Manuel. Still in the midst of a quarterback competition that has barely begun Kolb and Manuel are listed as co-starters, with just a slash between their names as they both appear in the starters column on the depth chart. It’s not the only instance where that’s the case. At left guard, Doug Legursky and Colin Brown are also listed as co-starters. It will likely take until the preseason games for these situations to change. The team’s first official depth chart is out and there’s an interesting pecking order on kick return. Second-year cornerback Justin Rogers is listed as the team’s top kick returner with Leodis McKelvin second and Brad Smith third on the depth chart. While it may be surprising to some knowing part of the reason Smith was signed as a free agent in 2011 was for his kick return abilities, the bottom line is Rogers outperformed Smith last season when he was inserted into the role late in the season. Rogers averaged an impressive 28.7 yards a return with 13 total on the season and a long of 57 yards. Smith on 15 returns averaged 18.8 yards with a long of 28. C.J. Spiller averaged 23.8 yards a return, but only had 6 attempts all season. Leodis McKelvin averaged 21.5 yards a return on just two attempts. Rogers was an accomplished return man in college at the University of Richmond. As a freshman he served in a return role ranking third in the nation in kick return average (30.4). As a senior he led the Colonial Athletic Association conference in punt return average (12.4) and set the CAA record for kick return yards in a career, most notably passing Brian Westbrook on the all-time list. Bills head coach Chan Gailey was asked several questions about some of the position battles that figure to be up wide open come training camp. Gailey doesn’t believe any of them are set in stone and neither is his depth chart. Gailey was asked when he’d have a depth chart set and he indicated right before training camp. The veteran coach also made it clear there isn’t much on his depth chart that’s immovable. Bills fans we’ve penciled in what we’ve been able to put together with respect to a depth chart in observing OTA practices. You can view our unofficial depth chart right here. Let us know what you think might change come training camp.